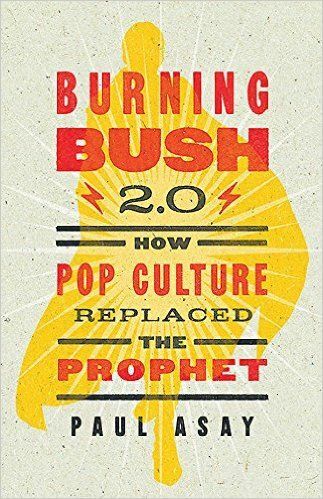 Burning Bush 2.0: how pop culture replaced the prophet by Paul Asay, who works for plugged in, "...an entertainment guide full of the reviews you need to make wise personal and family-friendly decisions about movies, videos, music, TV, games and books." Lively writing, at least one or more of the topics will appeal to almost everyone, plus encouragement to explore on your own and maybe write your own observations and insights. Scripture shows us the role and calling of prophet – the person who speaks truth to power – happened because God's people insisted on having human kings like all those other nations, all those everyone elses. Some of us remember Simon & Garfunkel telling us the words of the prophets are written on the subway walls and tenement halls―but that was so very local, right here in this 'hood, on this street! With the power and prevalence of the internet "Pop Culture" in the subtitle has reached and stretched much further than it had even at the end of the last century. Author Paul Asay brings micro overviews of cinema, TV cartoons, video games, music, etc. from the perspective of a mature adult who like most of his readers – and like this reviewer – lived on planet earth before the internet invasion. "Theologians of glory build their theology in the light of what they expect God to be like, inventing God to look something like themselves. Theologians of the cross build their theology in the light of God's own revelation of himself, particularly God's self-revelation in Christ crucified. In addition, the cross of Calvary forms a paradigm and model for God's characteristically hidden and paradoxical, sacramental presence in the commonest things, situations and people." But has Pop Culture Replaced the Prophet? The Hebrew scriptures distinguish the prophet – nabi – and the seer (into future happens and events) or roeh. Literally in-spired by the Spirit of Life, a prophet calls people out of complacency, points out transgressions, and presents God's life-giving alternatives. But in movies, TV shoes, video games, rap and ballads, does God reveal Godself, show us where and how established political, educational, environmental; and economic powers that be have failed us and what we can do to change the world around us? In this time and place? Are some aspects of popular culture also vehicles of God's current self-revelation? Think about it! Your own experiences and mine along with Paul Asay's make clear that no, we do not get to interpret everything in every cartoon or film as a message from heaven. Asay also cautions us to avoid aspects of pop culture we know negatively could affect us, possibly lead us into temptation and then into active sin. I appreciate that the author doesn't analyze much of anything in a whole lot of detail, but instead models what each of us might look for next time we watch a movie, listen to the lyrics of a song, play a video game. It also would be perfect for a confirmation or HS Sunday School class project so the students maybe could tell us How Pop Culture Has Replaced the Prophet or ask If Pop Culture Has Replaced the Prophet. Amazon Vine sent me an ARC uncorrected proof that lacked any back matter, images, indices, etc. the final book might include. my Amazon review: but has pop culture replaced the biblical-style prophet?